Beautiful diamond cut sandblasted gold finish. 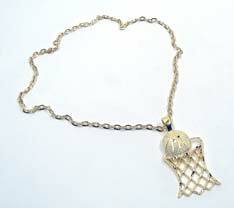 Hoop with ball pendant measures 1 ½ inches by 3 inches on a 24 inch gold chain. High quality finish! Secure C and tongue clasp. Sold individually. $4.70 each for 24 or more. $4.20 each for 48 or more.